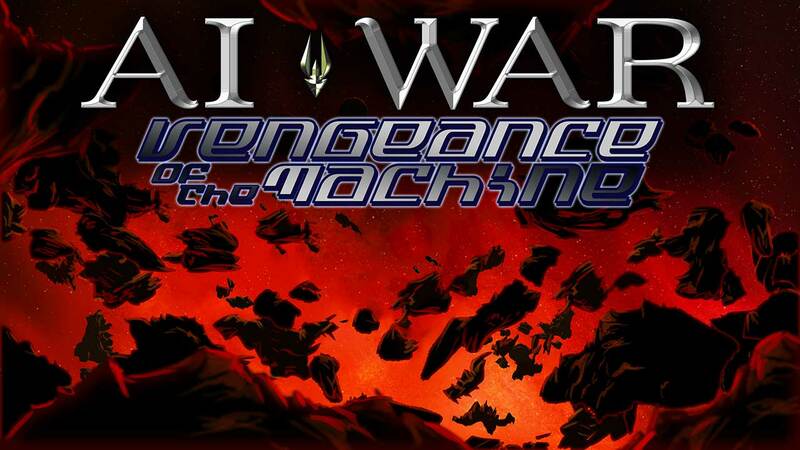 1 What exactly is added in the Vengeance of the Machine expansion? What exactly is added in the Vengeance of the Machine expansion? A: This expansion gives players some fun new toys but focuses on adding still more variety to your main opponent: the AI. There's already a ton of that variety, but our community is very excited about the new stuff VotM brings to the table, including "Dual-type" AIs, Dire Guardians, AI Planetary Subcommanders, and the "Hunter" and "Shark" AI plots. There are also new bonus ship types, AI types, map styles, core guard posts, guardians, core turret controllers, and more awesome music from Pablo Vega. The expansion also adds a new "Showdown" option that provides a brand-new way to win (or lose) in the form of an ultimate stalemate-breaker. This expansion is slated for official release in June 2013. Now you may optionally assign a secondary type to each of the two AI players so you can see what it's like to play against a Speed-Racer/Thief and a Spire-Hammer/Neinzul-Youngster (answer: the former is quite amusing in a morbid sort of way, and the latter is _rather_ challenging). You can also use it to "mix in" some of the new AI types like Chivalric and Bouncer to make the game perhaps a little easier in some ways, while still getting the distinctive features of the other types chosen. Now some of each AI's planets (mainly picked from the MkIV and Core ones) will have a "subcommander" represented by one of 10 new special command stations (like "Gravitic", "Translocator" and "Lance"). Most subcommanders can also pick from some of the 11 new special guard posts (like "Plasma", "Implosion", and "Widow") and most also try to be extra clever in how they place their station and guard posts. The "Paranoid" subcommander, for example, will place its station as far away from all the wormholes as it can, and pick only Command-Station-Shield posts and place them as far away from the wormholes and each other as it can. The "Knife Fighter" subcommander, on the other hand, will pick from short-and-medium range combat-oriented stations and posts and try to place them so as to cover all its wormholes with overlapping fields of fire. And so on, with types like the long-range-favoring "Lobber", the tractor-and-gravity-loving "Obstructionist", and the ever-popular "Rude Gesture" (who is not at all happy about no longer being able to stack 13 counterattack posts on its planet, having to settle instead for 4). See Planetary Subcommanders for full list. Normally you'll only encounter these through a few "Dire Guardian Lairs" seeded in each map (unless you disable them in the lobby). Each lair is normally not a problem... until its planet goes on alert. Then it starts building a Dire Guardian inside. You're warned when these are building and you'll want to be ready to take it down (not easy, but doable with major fleet action) when it spawns. For some lairs you'll probably want to deal with them permanently at some point, and you can do so by destroying them. But destroying them releases a one-time spawn of _three_ Dire Guardians. Ouch. If you have any "Exogalactic Attack" sources on (Fallen Spire, Broken-Golems-Hard, etc) then Dire Guardians are also eligible to seed in those. They're only one step below Hunter/Killer units in cost so it's not really making exos any more dangerous overall in terms of raw strength, but it does add more variety and thus more potential for picking a "killer combo" that your defenses will be hard-pressed to withstand. This AI refrains from targeting irreplaceable structures (like Advanced Factories, Fabricators, etc) other than your Home Command Station, and instead gets a bonus to the size of its Cross Planet Attacks. When present in an AI with a secondary AI Type, this type's "do not target irreplaceable structures" characteristic is dominant despite being a disadvantage. This AI uses normal guard posts instead of wormhole guard posts next to each of its wormholes. The result is that you generally take more losses the first time you attack a planet but you have a much easier time keeping it from reinforcing much if you choose not to take it. This AI is fascinated with bombardment and focuses on throwing lots of (preferably long-range) artillery units at you. Its defenses leave something to be desired, however. This AI does not send normal waves, and instead sends small "exogalactic attacks" (similar to those provoked by the Fallen Spire, Broken Golems - Hard, Botnet Golem - Hard, or Spirecraft - Hard minor factions) with methods of composition and approach very different from normal waves. This AI gets a larger-than-usual strategic reserve and uses part of it to defend important planets that are normally not reinforced from the reserve. This AI focuses on force-field-immune units and strong Cross Planet Attacks as a counter to fortified human positions. This AI retaliates with (relatively) small exogalactic attacks every time you destroy one of its guard posts, warp gates, command stations, data centers... it's kind of attached to a lot of things, actually. Doesn't take criticism well. This AI does not send normal waves, and instead sends LARGE "exogalactic attacks" (similar to those provoked by the Fallen Spire, Broken Golems - Hard, Botnet Golem - Hard, or Spirecraft - Hard minor factions) with methods of composition and approach very different from normal waves. If this is enabled, the AI gradually adds some extra-nasty units to its Special Forces. The SF fleet normally functions as a mobile defense fleet for the AI, but these extra units will make it far more... interesting. If this is enabled (A and B can be enabled separately), the AI gains strength every time one of your command stations falls. Normally it's fairly minor when a human player loses a planet unless it was a critical defense point or had some important irreplaceable structure, but with the Shark plot once the AI smells blood in the water things could get out of hand in a hurry. Shark-A gains AIP with each human command station death. Shark-B gains no permanent bonuses with each human command station death, but does launch immediate follow-up ("go for the throat") attacks and contributes an extra chunk to the next Cross Planet Attack. Like all Core Guard Posts, these only appear on AI Homeworlds. This guard post is armed with several high-power implosion cannons that are extremely dangerous to large targets, but are thankfully relatively shorter-ranged than most implosion weapons. Unfortunately, this post also launches "Implosion Drones" which (while much shorter-ranged still, and the drone self-destructs when it fires) charge at enemy ships to fire several lower-power implosion rounds. This guard post is armed with massively powerful artillery cannon designed to cripple or destroy larger targets. It can't even shoot at smaller units. This guard post fires many shells that aren't massively powerful but do significant engine damage. Also, the post mounts many tractor beams which paralyze their victims. This guard post is armed with a powerful shotgun weapon, but its main danger lay in the fact that when damaged, it spawns "Shredder Drones" which then attack human units. If one of these shredders does enough damage it replicates itself. Further, after a shredder has existed for 30 seconds it will automatically scrap itself and restores a chunk of health to the Shredder Drone Guard Post (if the post is still alive). This guard post is armed with powerful Energy Wave cannons, but a far greater danger lies within: if an AI unit dies on its planet or any adjacent planet, or if any adjacent planet is not AI-held, this factory deploys the fearsome Hunter/Killer unit it has constructed. After deploying the H/K, the factory builds another in 30 minutes. A particularly uncomfortable variant of the Tractor Guardian which also paralyzes its victims. Dangerous in its own right, but the real problem is that this guardian boosts the attack power of nearby allied ships. Bristles with banks of needlers. Best dealt with very carefully. Shoots rockets. LOTS of rockets. Beware its immunity to your forcefields. Not as individually dangerous as some other guardians, but its ability to protect nearby allies from incoming fire is actually often far more dangerous than additional firepower would be. So the AI took a gun. Then it put an engine on that gun. You are looking at that gun. If something is unfortunate enough to be shot by that gun, it will take a lot of damage. Other things nearby will take some damage too. If it hits a forcefield, stuff under that forcefield also gets hurt. Planets are arranged in a wheel-like shape with a number of spokes and a rim. Planets are arranged in a hexagonal pattern. Some map seeds leave just a few gaps in the pattern, others have many gaps creating a very different overall effect. These are capturables quite similar to Fabricators (which allow you to build a specific MkV ship type), but instead allow you to build a specific type of MkV turret. The other big twist is that these MkV turrets have PER-PLANET caps, instead of galaxy-wide caps. So if a Core Spider Turret Controller gives you a cap of 24 MkV spider turrets, then in theory you can build 24 MkV spider turrets on every planet you own (and all planets adjacent to those, as you also have supply there). In practice you generally won't be able to (or want to) spend _that_ much energy (or potentially metal or crystal) on turrets but either way this gives you much more flexibility for distributed defense. Has modest firepower in its own right, but primarily attacks by launching miniaturized versions of the Lightning Warhead (that do not increase AIP when detonated, of course). A powerful starship designed by the Zenith during their ancient wars against the Spire (who heavily rely on shields). Its shots completely ignore forcefields (though the devastator itself does not ignore forcefields). Cannot target small ships. Small Starship-class modular vessel designed to defend other ships via passive and active defense systems. Counter-Missile Module: Shoots down a finite number of incoming enemy missiles per second. Counter-Laser Module: Shoots down a finite number of incoming enemy laser shots per second. Counter-Shell Module: Shoots down a finite number of incoming enemy shells per second. Counter-Energy-Shot Module: Shoots down a finite number of incoming enemy energy shots (which is a broad definition including negative energy, energy waves, implosion shots, impulse reactive shots, energy bombs, flame waves, etc) per second. Protector Shield Module: Provide protections to any allied ship within range. The generator itself is relatively weak and cannot hold up under intense fire, but does protect a much wider area than most mobile shield generators. A fast-attacking cloaked raiding ship, with a youngling's very short lifespan. Mature Neinzul organism without the time-limited lifespan of a Youngling. The railpod is basically an organic railcannon, with effectively infinte range. The downside is that firing the cannon does tremendous damage to the railpod itself, generally destroying itself after only two shots. Despite this limitation, railpods can contribute significantly to "burst" damage either defensively or offensively, and a group of space docks loop-building these with engineer support effectively becomes a large artillery battery. A potent short-range combatant that breathes (plasma) fire and can regenerate its own health over time. This is probably the biggest single feature of the expansion, and it provides another way to turn the normal "Guerrilla War" into a "Frontal War". Like Fallen Spire, to win by Showdown you'll need to withstand a truly tremendous AI attack. Unlike Fallen Spire, you can start the final confrontation simply by capturing four specific planets (the ones with the "Showdown Devices"), and that confrontation only lasts about 30-40 minutes (less, if you're unsuccessful). We hope many of you enjoy devising new strategies to deal with the particular challenges of winning (or losing) via Showdown. This page was last modified on 26 October 2018, at 14:51.